The Professional Hunters’ Association of South Africa (PHASA) takes it social responsibility seriously and in 2003 established the PHASA Conservation Fund. Initially, the aim of the Fund was to promote and directly fund worthy conservation and research projects. 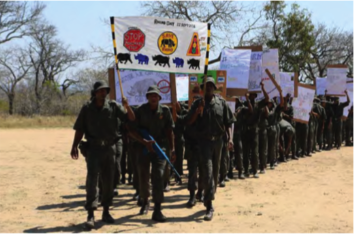 In 2005, the Fund extended its mandate, and its name was changed to the PHASA Conservation and Empowerment Fund. It promotes the empowerment of previously disadvantaged individuals and communities, primarily through direct funding of training and skills development programmes. The Fund is a registered, non-profit company and a Memorandum of Incorporation governs its management. The Fund is governed by a Board of Directors and is subject to an annual audit (copies of the Fund’s financials are available on request). The Fund is income tax-exempt and issues Section 18(a) certificates in respect of donations received. Donations in respect of anti-poaching projects towards EWT; Wildlands Conservation Trust and SANPARKS;K9, and rhino anti-poaching programmes of WESSA, EWT, the Wildlands Conservation Trust, Zululand Rhino Reserve and SANParks. The Southern African Wildlife College (SAWC) in Hoedspruit, Mpumalanga, has trained more than 1 200 students from previously disadvantaged communities in conservation management. This training has been made possible through R11 million raised by the Fund at the PHASA “African Wildlife Heritage Gala Dinner”.